I hope everyone enjoyed the Thanksgiving weekend (for my US friends)! As I need some time to meet writing deadlines, get caught up on reading and celebrate Christmas, I'm going to take a book reviewing vacation for the rest of 2011. Yes, a month is a long time, but I hope to come back renewed and refreshed! I will definitely pop in from time to time, so please keep checking back! And just in case you missed any, below is a list of my Marvelous Middle Grade Monday and Picture Book Thursday reviews from the past couple of months. Thanks for stopping by and I will be back in 2012! Also check out my blog list to the right for other MMGM blogs. I've also added a few picture book resources to my blog. Check out the list to the right. Since tomorrow is Thanksgiving, I thought I would put tomorrow's post out a little early. Today is my last November post for Picture Book Month, and I'm featuring one of my favorite authors, Michigander Kelly DiPucchio. Enjoy! CLINK is a heart-warming story about an old robot who needs a home. He was a World's Fair Award winner who could play music and make toast at the same time. But that doesn't interest the buyers who come into the robot shop. Clink would watch as other robots were sold to new owners and cry rusty tears. Then one day, he gets the surprise of his life when a young boy actually wants HIM! A great story of acceptance and not trying to change who you are for others. Now, let me turn things over to Kelly DiPucchio. Kelly has 13 books to her credit, and stated, "My 13th picture book was released in August of this year. I think it’s kind of appropriate that book #13 was ZOMBIE IN LOVE." I have also reviewed her bestselling GRACE FOR PRESIDENT. 1. What was your inspiration for CLINK? About 3-4 years ago I received an email from an illustrator who wrote to compliment me on a picture book of poetry I wrote called SIPPING SPIDERS THROUGH A STRAW. In his note, he invited me to check out his website. To be honest, I had little or no expectations when I clicked on the link. Boy, was I surprised! His online portfolio was amazing! His art was quirky and ironic and I could immediately tell his style was perfect for children’s books. While browsing the site, I noticed a lot of really cool robots. There was one painting in particular that caught my eye. It was a picture of an old robot sitting on a bench in a subway station. The robot looked very sad and dejected. I wondered why. I knew he had a story to tell. So, I wrote it. If you haven’t guessed by now, the artist who wrote to me that day was Matthew Myers, the illustrator of CLINK. After I checked out Matt’s portfolio I immediately forwarded his website to my agent, who immediately saw what I saw, and welcomed him into the fold. Several months later, Matt and I both had contracts with Balzer & Bray to publish CLINK. 2. You write in both prose and rhyme. How do you decide which way to go when writing a picture book? That’s a good question and one that comes up from time to time. For me, it’s not really a conscious decision. The format is almost always determined by the first couple of lines in the story. Sometimes the lines will pop into my head in rhyme, and other times, I will hear them in prose. I have no idea how or why that happens, but those beginning lines invariably set the course for the remainder of the story. I actually prefer to write in prose so when the lines come to me in rhyme, they’re often followed by a strong urge to bang my head repeatedly against a hard surface. Writing in rhyme is much more difficult for me! 3. Do you have any future projects you could share about? I’m really excited about a picture book I have coming out in February called CRAFTY CHLOE. It’s the first book in a new series with Simon & Schuster about a little girl who loves to make stuff. Heather Ross is the illustrator, and she did an amazing job of capturing the creative spirit of Chloe. 4. What are your thoughts on the future of picture books? I’m not usually a Chicken Little but I’d be lying if I said I wasn’t a little nervous about the future of picture books. Younger generations of readers don’t have the same love affair with books like older generations do. I love the smell of new books. I get excited by pristine book jackets and interesting covers. I swoon over bins of old books and the dog-eared pages of beloved classics. Teenagers today are completely comfortable getting all of their information and entertainment in electronic form. In fact, they expect to get it that way. It won’t be very long before these same kids will be having children of their own. Will they go out of their way to buy traditional books for their children or will they do what they’ve grown accustomed to doing– downloading files from a computer? That being said, I certainly hope there’s room in the future for both traditional books and eBooks. 5. Do you have any helpful insights for aspiring picture book writers? It would be hard for me to add anything that hasn’t already been said a thousand times. If aspiring writers are doing their homework, they know what to do. At the risk of sounding like a fortune cookie, I offer this insight: Writers are more likely to reach their goals if they’re having fun and enjoying the process. I have met some of my very best friends in this industry because we share the same ups and downs of the business. We laugh. We cry. We gossip. And we complain. But then we get back to work. Having a network of support with other kindred spirits is invaluable both personally and professionally. Thank you so much for sharing with us, Kelly! For more info, please check out Kelly's website. Today concludes my posts with Michigan authors. I hope you enjoyed these past few weeks. It has been fun to share them with you. Check back for more exciting and entertaining picture books and even more links with more info. And again, a Happy and Blessed Thanksgiving to you and your families! For this week's Marvelous Middle Grade Monday, I'm featuring SECRETS AT SEA, a great tale of adventure about a family of mice during the late 1800's. My blogging friend Joanne Fritz has also recently reviewed SECRETS AT SEA and even met Richard Peck. Check her blog out for more info. In the beloved tradition of The Borrowers, The Tale of Desperaux, and The Cricket in Times Square, here is an irresistible adventure story of the tiny individuals who secretly live among us humans. Helena is the oldest of four mouse siblings who live in the walls of the Cranston estate. It is 1887 when the nouveau riche Cranstons decide to take a cruise ship to England in search of a husband for their awkward older daughter. The Cranston mice stow away in the luggage . . . and so begins the time of their lives, as they meet intriguing, cosmopolitan mice onboard and take it upon themselves to help the human Cranston daughters find love. They might just find perfect futures for themselves as well! Full of laughs, near-misses, and surprise, this is Richard Peck at his best and most playful. This book was such a fun read, quick read! It does remind me of The Borrowers or even The Littles. (I loved them when I was young.) The story is written in first person and told by Helena. What I loved the most were the surprising twists Peck weaved throughout the story. Many of the surprises revolve around the love lives of the human Cranstons as well as the mice Cranstons. Helena's own personality and attitudes changed some throughout the story as well, and it was interesting to follow along as she developed as a character. It was also fun to read the bits of history and the proper English attitudes, even held by the mice. It is amazing to think of mice leaving co-existent lives with their humans. I also always enjoy reading how mice use human items for their own living and transportation. I definitely recommend SECRETS AT SEA, for the young and old alike! And check out the blog list to the right for other recommended Marvelous Middle Grade Monday reviews. For the third Thursday of November, I am featuring Michigan author Boni Ashburn and her book I HAD A FAVORITE DRESS. I love this book, and it is definitely for the girls in your life! The book starts with the little girl sharing her favorite dress that she wears every Tuesday, her favorite day of the week. Throughout the book the dress is modified and changed as the girl grows bigger and bigger. What the dress changes into at the end is cool to see. I also like the progression of the book as it flows through the rest of the days of the week. Definitely will make a great Christmas present! I plan on buying at least one copy as a gift. Now let me turn it over to Boni Ashburn, the author of three other picture books as well. To find out more, check out her website. 1. What was your inspiration for I Had a Favorite Dress? My kids really enjoyed the book Joseph Had An Overcoat (the version by Simms Taback is our favorite), but I always had to explain all the different items of clothing- like suspenders, handkerchiefs, cloth-covered buttons, etc, that they weren't familiar with- every time we read it! I thought it would be great to have a kid-centric version that they could more easily identify with. And then when my daughter lamented one day about a dress getting too short, I knew I had my story. Since I can't sew, the least I could do was write a story for her! Interesting question! The form seems to come to me along with the idea- I don't usually ponder which way to go. If it's a retelling, I guess I start with the form of the original- I think it makes the new theme or setting "pop" more, although I do have an upcoming book that is inspired by a prose story and it came to me in rhyme. A lot of times I will start with a phrase or line that I hear in my head and I can pretty much tell if it will work better in prose or rhyme from the start. I couldn't always though- when I started writing, I was a terrible rhymer with NO sense of rhythm. It has very much been a learned process for me! My next book is coming out in February, I think, from Sterling Books. It's called Builder Goose: It's Construction Rhyme Time! and is a fun, construction-themed collection of Mother Goose poems. I have two other projects that are in the illustrator-search stage (one with Abrams and one with Beach Lane Books). Oh, I think real, hold-in-your-lap picture books are so important for children of all ages and for so many reasons. I still read picture books with my 10-year-old twins every night! We enjoy them as picture books and illustrated stories, but also for learning writing concepts and skills and for learning to think critically about writing and art. My kids know how to analyze a picture book and formulate opinions and theories and articulate those ideas. It's amazing to me how much they can get out of a 32 page book. It is an experience I hope all children have and continue to have for a long time to come. I'm not against technology at all, but I do think something of the reading experience is lost in e-books and apps and "added content". I suppose I hope that they can all co-exist in the world as different ways to experience creative content, but that the value of traditional picture books isn't lost. Read, write, read, write, read, write, repeat. And repeat and repeat and repeat! That is the single best way to get successful at writing picture books in my opinion. 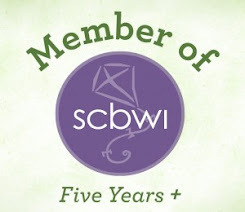 I have a page on my website that covers a lot of the basics, like places to go for information about the business, organizations to join (SCBWI!! ), etc. But the best piece of advice I ever read was on Linda Sue Park's website: read 1,000 of the type or genre of book you want to write before you start writing. I would modify that a bit and say to go ahead and start writing as you do that reading research, but realize that whatever you write at this stage may just end up being practice. You truly have to understand the picture book form as organically as possible to be able to write a successful one, and the best way to do that is through reading so many of them that you can write one almost without thinking about what you're doing. So all of that, and intelligent persistence, and patience. Lots and lots and lots of patience! Thank you so much for sharing with us, Boni! Best of luck in your future manuscripts. And stop back next week for my last Michigan spotlight of November which will feature Kelly DiPucchio and her book CLINK. In his last adventure, Bobby Ellis-Chan got stuck to a tree, had underwear attached to his back, and faced down a whole wolf pack of girls. What could be scarier or more embarrassing than that? Playing football with his dad - a pro linebacker (or even worse ... with his sister!). He's sometimes brave, he's sometimes silly, he's frequently in trouble, and he's always fun to read about. He's Bobby! When a sequel is written, there is always the question - Is it as good as the first? In this case, I would give a definite YES. The situations Bobby gets himself into are once again hilarious. But even more so than the first book, his relationships with his family, especially his dad are explored in more depth. By the end of the book, Bobby and his famous father finally have the conversation that's been brewing since the beginning of Bobby vs. Girls. They understand one another more so now than ever, and I'll be curious to see if a third Bobby book is in the works. For more Marvelous Middle Grade Monday reviews, check out my blog list to the right. Have a great week! For the second Thursday of November, I am featuring Michigan author, Lisa Wheeler and her book UGLY PIE. I have to say that I fell in love with UGLY PIE when I heard Lisa read part of the book at one of her Picture Book Boot Camps early this year. Hearing her read it in her own rhythm and rhyme was so cool! UGLY PIE follows Ol' Bear on his quest for a pie, but not just any pie, Ugly Pie. As he walks to his neighbor's houses, he finds many different pies, but no Ugly Pie. His kind neighbors do offer him an assortment of foods, which when he arrives home, he realizes are all the ingredients he needs for Ugly Pie. He gets busy in the kitchen and soon his friends all flock to him for some of his scrumtious Ugly Pie. Now I will turn things over to Lisa Wheeler, author of Ugly Pie and many, many other children's books. Check out her website for more information. 1. What was your inspiration for UGLY PIE? It was around Thanksgiving time and I was baking pies. I was on the phone with my good friend and children’s author, Hope Vestergaard. She asked what I was doing and I said, “Baking pie.” She asked “What kind of pie?” and since my baking/cooking skills are not all that great, I looked at the mess of a pie on the counter and said something like, “It’s an ugly pie.” Hope thought that Ugly Pie would make a great title for a book and asked if I would like to use it. I agreed and even though I knew it was a terrific title, I felt a little guilty because I had no story idea. I knew that Hope could probably whip up something wonderful with that title. So my subconscious came to the rescue and I woke one morning soon after with the voice of Ol’ Bear in my head and he told me he was just itchin’ for some ugly pie. If that hadn’t happened, I would’ve offered up the title to Hope. I am grateful she planted that seed in my head. I actually let the story decide. Most of my books begin with either a voice, wordplay, or character. If it begins with wordplay, it’s usually in rhyme (like One Dark Night, Bubble Gum, Bubble Gum and Where, Oh, Where is Santa Claus?) But stories that begin with character or voice usually guide me themselves. Yes—thanks for asking! In Fall of 2012, the newest installment in the Carolrhoda dino-sports series will be released. It’s Dino-Football and this time the teams will be playing the big game at the Lava Dome. Barry Gott has done it again as he illustrates dinosaurs of all sizes playing together on the same field. He amazes me with his talent. Then, in 2013, I have another book of funny poems coming out with Atheneum. This one is tentatively called Pet Project and will have a sub-title like my previous collection Spinster Goose: Twisted Rhymes for Naught Children. The illustrator is Zach OHora. My thoughts are that they have a future! I refuse to be a doom-sayer, wringing my hands, and worrying about the state of picture books. My first advice is always to read picture books. Read what is new and now. Spend lots of time doing it. Then, start writing. Allow yourself to fail. I had over 200 rejections before I sold my first picture book manuscript. (I still get lots of rejection.) But if you are not reading, writing, and submitting, then you will never know where your dream will take you. Just remember, in this business, the only thing you have any control over is that manuscript while it is in your hot little hands. Don’t send it out prematurely. Learn your craft. Read. Write. Thanks so much for sharing with us, Lisa! And remember to check out Lisa's website. I love so many of Lisa's books, but I will also give a shout out to the Dino-sports books, for my younger son. He was so excited when I told him about Dino-Football! Stop by next Thursday for a review of I HAD A FAVORITE DRESS by Michigander Boni Ashburn. Happy Monday to you all! Today I would like to discuss another Newbery Medal Award winner, SARAH, PLAIN AND TALL. Yes, the first time I read it I was in grade school, but I recently read it again and noticed much more than when I read it as a middle grader. The novel is set in the midwestern United States (Kansas) during the late 19th century. Jacob Witting, a widowed farmer who is still saddened by the death of his wife several years earlier, giving birth to Caleb, finds that the task of taking care of his farm and two children, Anna and Caleb, is too difficult to handle alone. He writes an ad in the newspaper for a mail-order bride. Sarah, from Maine, answers his ad and travels out to become his wife. But Sarah grows homesick - the prairie grass didn't substitute for the Maine sea shore. When Sarah leaves for a trip into town, the kids wonder if she would come back. And she did. She had brought back colored pencils so she could show them the beautiful colors and views of Maine and gorgeous sea shore. She, Anna, Caleb, and Jacob have a lot of good times that lead to Caleb loving Sarah even more, but Anna thinks that she will replace her mother. In the end Sarah and Jacob get married. First, although when reading it the writing style seems vague, when I finished the book I realized the details were woven in so well I didn't even notice. Second, the main conflict is not what you would think. Instead of the main conflict being if Sarah would take control and make Anna and Caleb miserable as their new "mom," it truly is whether or not Sarah will stay. Third, Anna's relationship is deeply explored with all the characters, her father, Caleb and especially Sarah. If it has been awhile since you have read SARAH, PLAIN AND TALL, I would recommend picking it up again. If you haven't read it for the first time, add it to your "to-read" list. November is National Picture Book! In celebration, each of my Thursday reviews for November will feature not only a book review, but also some questions answered by the author herself (they just all happen to be female). Another special trait of the four authors I will be featuring is that they are all from the great state of Michigan! An ordinary day on the farm turns into anything but ordinary when a wolf sneaks into the farmyard. The chickens scramble out of their coop and into the woods. What follows are their misadventures in the woods as they are too scared to go home. But, a funny thing happens and by the end these four Big Chickens become big, brave chickens as they strut home. I love how the story comes full circle, taking the chickens from timid, scared birds and turning them into proud, strong chickens. Much of the story's feeling and vibe comes from the vivid, fun words Leslie uses. The chickens come back in two more stories: BIG CHICKENS FLY THE COOP, where the chickens are determined to visit the farmhouse and BIG CHICKENS GO TO TOWN, where the chickens wind up in town and get into their usual trouble. Now I would like to turn it over to Leslie Helakoski, the amazing writer of the Big Chicken books as well as three others, including FAIR COW, which she also illustrated herself. 1. What was your inspiration for BIG CHICKENS? 2. When you wrote BIG CHICKENS, did you have sequels in mind or did they evolve over time? No, I didn't have sequels in mind. The publisher asked for them. But fear was an easy topic for me. The second book, BIG CHICKENS FLY THE COOP, is about being afraid to venture out into the world to follow your dreams and running back to where it is 'safe'. And the third book, BIG CHICKENS GO TO TOWN, is about fear of something new and is set in my favorite city-- New Orleans. I'm working on a book called 'Under the Table' for Boyds Mill Press right now. It is deep in the revision stage and feels all torn apart right now. But I will get it back together eventually. The art is due this spring, so I have to get going! We're smack dab in the middle of a big change, that is for sure. But there will always be a place for pictures and stories, though the formats may be different than what we are used to right now. Hold a child on your lap and read to him. Read all kinds of different things and see what he responds to. Keep that in mind but write for yourself. If you don't like what you write, no one else will either. And of course, join SCBWI and attend as many conferences as you can. A big thank you to Leslie for sharing with us today!! On November 13, she will be the guest blogger at Picture Book Month. And please check out her website, too. And join me next week for some time with Lisa Wheeler, author of 30 books for children including UGLY PIE, which I will be reviewing.